So far I've had a pretty productive bank holiday. I started work at 5. Came home, bleached my roots, dyed my hair and even did a makeup look too. 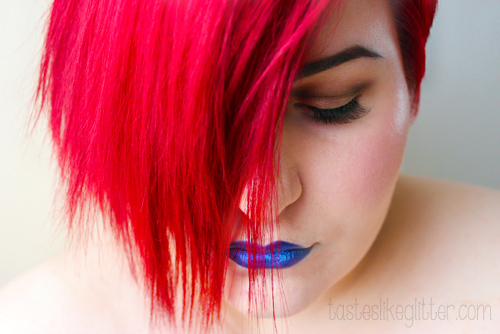 I've been craving deep blue lips lately and I have the perfect lipstick for it. Illamasqua's Disciple*, it's a matte deep navy blue. I've had it since The Art Of Darkness collection a couple of years ago but it's extremely dry so I found it difficult to work with.